WeatherTech TechShade Full Vehicle Kits help keep your entire vehicle's interior temperatures down while protecting it from the sun's damaging effects. TechShade Full Vehicle Kits include 4 or 6 pieces depending on the vehicle model. 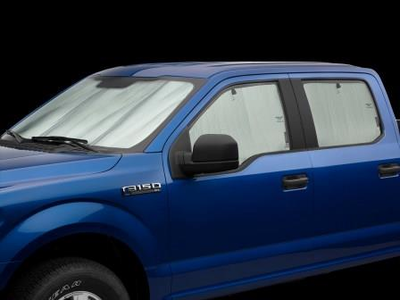 TechShade kits are custom-fit, and when properly installed, will remain snug in each window opening on the vehicle. Each TechShade features a foam core, which makes for easy handling and a sturdy fit. After use, simply pull on the shade's pull tabs and roll all pieces together using the easy roll up and store Hook & Loop strap. There are many different sizes. Please contact us for a price.